Whenever you hear the term “metal roof” you might imagine an old-fashioned tin roof, ridged, rustic, and maybe even somewhat cheap in appearance. However, there have been major advances in materials, application, and design that are used in metal roofing, which makes this kind of roofing system more durable, elegant, and increasingly popular as an option with building owners. There are, in fact, many choices that are available for property owners, that depend on the specific look that you want. They may be made out of recycled metals such as tin, aluminum, copper, and stainless steel – the surfaces may also be designed so that they look more like traditional shingles while having an up-to-date, sleek appearance at the same time. Durable: Metal roofs are well-known for having long lifespans. In fact, a majority of the time they have a 30-50 year warranty that comes with them and typically can outlast the lifespan of any type of building structures. They are also very lightweight when compared with other types of commercial roofing materials, making them easier and faster to install. These qualities allow metal roofs to be installed over another pre-existing surface so that there is no need for time-consuming and wasteful demolition. Water Resistant: Their sturdy construction allows them to stand up against the elements. Whether that is driving, heavy rain, insect infestations, or hurricane-level winds they are able to stand up to any kind of weather. They are rust-resistant and rot-proof as well (as long as they are installed properly and galvanized). More Fire Resistant: Metal roofs are non-combustible, so that should save you money on your property insurance expenses (unless the roof is installed over flammable materials, such as wood shingles). They are not more susceptible to lighting compared to other kinds of materials (no matter what your roof is made of, lightning strikes at all high points. However, you might want want to invest in a lightning rod). More Watertight: A metal roof works very well to seal out moisture, and due to its slick surface, a buildup of snow will slide more easily off of the roof compared to other types of materials. More Energy Efficient: They reflect sunlight and UV rays during the summer, which helps to save you money on your utility bills. Although metal roofs do not use insulation extensively, there should still be a gap between the actual roofing structures and the exterior surfaces. During the cold winter months, the gap will provide ventilation as well as interior thermal reflection that helps with re-directing heat back into the property. Like any type of roofing system, metal roofs are, of course, not perfect. However, it is possible to avoid even the inherent deficiencies. Tend To Be more Expensive; Metal roofs are not cheap (normally cost $200-$500 per each 100 square feet). However, since they are very durable as well, if you are planning to keep your property over a long period of time, then a metal roof will provide you with an excellent return on your investment (that adds to your property’s value as well). May Be Noisy: Whenever it rains hard, it may sound as if someone is drumming on top of your roof. However, there are things you can do to mitigate this sound: a few of the options that are available are soundproof sheathing or insulation. Susceptible to Denting: A metal roof may be more prone to damage from hail, but there are some products that come with guarantee against denting. There are even guarantees against the showing of footprints on the roof. May Be Slippery To Walk Over: Although there are some benefits to the slickness, if you are needing to walk on the roof, you will need to be very careful and be sure to watch your step. There are metal roofing materials that are textured so that they imitate the appearance of shingles as well as other materials that may act as a slip guard and are architecturally pleasing as well. It is very important to be aware that a metal roof is subjected to the highest amount of thermal movement (contraction and expansion) of all types of roofing systems. This results in pressure being exerted onto the fasteners, flashing flanges, and overlapping seams. 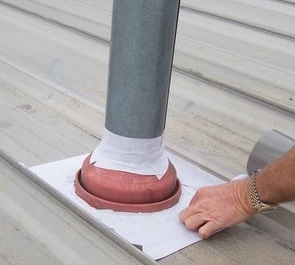 Over times, these important roofing components may become separated, and allow moisture to penetrate below. That can often lead to having to replace a roof prematurely. Roof replacement is expensive, and repairs are often sufficient to extend the lifespan of a commercial roof until it can be replaced. Having a roof maintenance plan is the best way that the lifespan of a commercial roof can be increased. Our maintenance plans provide an annual inspection to offer all of the maintenance that is necessary and to make any small roof repairs that are needed before they turn into expensive replacements. Typically, standing seam metal roofing is not the cheapest kind of roofing system to have installed. However, when you consider the shorter life expectancy, repairs and maintenance of the traditional flat roof, standing seam metal roofs have obvious cost advantages. Onsite roll forming helps to reduce the cost of materials through cutting the middle man out and the associated shipping costs that come with purchasing traditional factory formed panels. That is especially true with large industrial and commercial buildings. It allows for greater levels of control and quality since the panels may be cut to the exact fit and length with the horizontal joints. Call Armadillo Roofing & Exteriors and speak with one of our metal roofing experts today. Find out how you can get started with saving money with a LEED compliant and energy-efficient metal roof. Taurus Elite Commercial Roof Systems, 512-332-4422, provides commercial roofing services to Austin, Texas and the surrounding area, including Oak Hill. This includes commercial metal roof repair, commercial metal roof restoration, commercial metal roof replacement and commercial metal roof installation. We have been providing professional commercial roofing services to the area for over 20 years. When you need an experienced, honest commercial roofing contractor to give you advice on your metal roof repair, give us a call.